Holder creation. 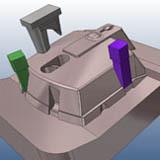 Holders can be constructed manually by applying width, depth or height,or simply selected from an extensive library. 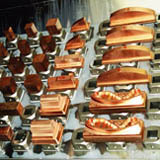 Where access for the electrode is limited by neighbouring surfaces, the holder can be offset from the center of the electrode to provide enough clearance for the EDM machine to operate. 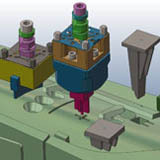 Dynamic animation and collision checking ensure that the complete electrode does not violate the part geometry.